HAILING FROM SINGAPORE, NEW MOON IS A PREMIUM BRAND DEDICATED TO PROVIDE FOOD OF EXCEPTIONAL QUALITY FOR ITS DISCERNING CUSTOMERS. New Moon endeavours to expand its reach to discerning consumers globally with a distribution network spanning various countries. 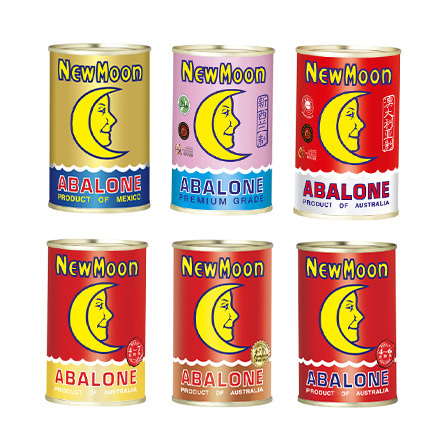 New Moon offers a variety of its flagship product, Abalone, from various regions around the world to cater to the various taste profiles and texture preferences of its discerning customers. The exquisite Mexico abalone instantly adds prestige to any meal. Endeavours to maintain its position as the Number 1 best Selling Abalone brand in Singapore and aims to expand its distribution network globally. The brand aspires to be the foremost choice for astute consumers worldwide. Committed to provide premium quality food to satisfy the varying needs of its consumers and exceed their expectations. We promises to always be trustworthy, responsible, loyal and a friend to its consumers and stakeholders.